I still had a few pears from the orchard and the figs are almost finished. Why not a Pear & Fig chutney? Easily done! This is everything a chutney should be. The flavors of the pears, combined with the figs' texture and sweetness, the plump raisins and blend of vinegars easily marry to the aromatic spices. And a quality cracked black pepper brings just the right amount of bite to the dish. This recipe will produce about 12 oz. of very useful fruit chutney. In a medium saucepan, place the pears, figs, vinegars and heat over medium for 15 minutes, stirring occasionally. Try this on nice slices of ham baked and cut off the bone, most pork cuts and roast lamb, or well-seasoned fowl. It looks just delicious, Amos. Thanks. It IS! I do hope you will give it a try and get back to me. Not difficult to pull together and your guests will find it very satisfying. Thanks you, Donna! Amos this sounds awesome. I've been looking for a fig relish or chutney to top brie. Thanks for sharing! This is just what I was looking for! I am attending a wine and cheese party this weekend, and was asked to bring an appetizer platter. Cheese platter, assorted crackers, and this wonderful looking chutney!! Not so boring a platter after all, thanks to you! I love chutney, and pears are my favorite fruit for winter. What could be better. Plus, the gentle blend of spices makes my mouth extremely happy. I made a small batch for myself; now I may do this for holiday gifts too. Will try this as soon as figs appear. This looks nice and interesting. Hi, Judee - That is EXACTLY what I am serving ot warm up New Year's Eve at our place. I am plating an assortment of cheeses and pairing them with the Pear & Fig Chutney, the Fig with Rosemary & Lemon, and the Fig with Orange & Honey combinations I preserved this Autumn. I am sure the guests will enjoy the comparisons and the pairings. Let me know if you follow through! I am a fig lover and this recipe sounds like an interesting sauce for a variety of uses. I think this would be great with a cheese platter for the holidays! 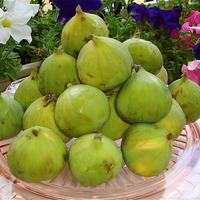 Amos, I am a fig lover and this recipe sounds like an interesting sauce for a variety of uses. I think this would be great with a cheese platter for the holidays! Hi, Judee - That is EXACTLY what I am serving to warm up New Year's Eve at our place. I am plating an assortment of cheeses and pairing them with the Pear & Fig Chutney, the Fig with Rosemary & Lemon, and the Fig with Orange & Honey combinations I preserved this Autumn. I am sure the guests will enjoy the comparisons and the pairings. Let me know if you follow through! Stacey - Thanks, so very much! You have given me a wonderful Christmas present with your kind words and positive review. I hope all is well with your family. Hi, Pat - I like it with appetizer cheeses. Have not tried Brie, but it balances well with some of the stronger cheeses. And very bright with a Manchego. Thanks for the encouragement and great to hear from you, as always!